From standing on the street to a restaurant seat there are so many places to eat and so many types of cuisine in London that you’ll never be able to experience it all. Strong cuisine influences from India, the East,the Mediterranean, and the Americas have strongly influenced the food scene in London resulting in one of the biggest city menus in the world. There are of course there are some classic dishes that have stood the test of time and remain very popular. 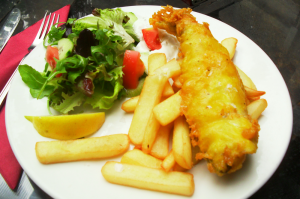 One stalwart performer that remains very popular is Fish and Chips. The 19th Century saw the emergence of fish and chip outlets. It is claimed that one of the very first was opened by Joseph Malin, within the sound of Bow Bells in East London at around 1860, however Lancashire claim earlier rights to the original fish and chips stalls. The British Empire created the perfect conditions for Eastern food to establish itself in the UK. Curry has been thought as of one of the most popular dishes in London for some time, with some incredible Indian restaurants serving superb dishes. Curry is a very versatile dish and can come in many forms. Britain has even put it’s ow twist on many and is famous for having created the infamous Vindaloo curry. 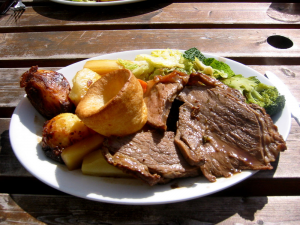 Roast Beef & Yorkshire Puddings is the national dish of Britain and has been popular for years. Yorkshire puddings are a fantastic accompaniment with many meats, but there is an increasing number of people using them in sweet desert dishes too.